Highlighting concerns raised when the Eighteenth Amendment was passed, the recent appointment of the Police Commission shows just how unacceptable the new framework for independent bodies is. 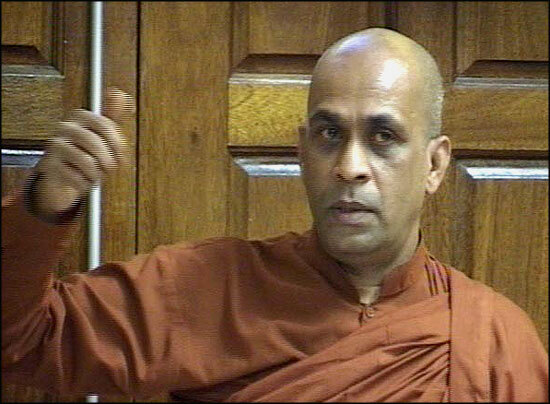 The appointments to the new Police Commission includes the Buddhist monk Elle Gunawanse. It is difficult to imagine someone more unsuitable to serve in the Police Commission, of all things. Truth, sometimes, is really stranger than fiction. Gunawanse was subsequently reported being seen at the Cinnamon Gardens Police station, having come in a jeep with a pistol tucked under his robes, demanding curfew passes. Alle Gunawanse was known to be a firebrand Buddhist monk with a tendency to go out of control once he began to speak. There were several monks like Gunawanse, who began their careers by encroaching on state land and putting up a small structure. Their success depended on political patronage. Gunawanse too encroached on crown land in Colombo 7 (Cinnamon Gardens) opposite the BMICH on Bullers Road. It was well known to contemporaries that Gunawanse had strong links with late Minister Gamini Dissanayake and was a recipient of patronage from the Mahaveli Ministry. His humble structure was replaced by an impressive one from state funds, and in honour of the Maheveli Project received the grand name of Maheveli Maha Seya. He also acquired a Pajero Jeep – the symbol of the new rich of the Jayewardene era. 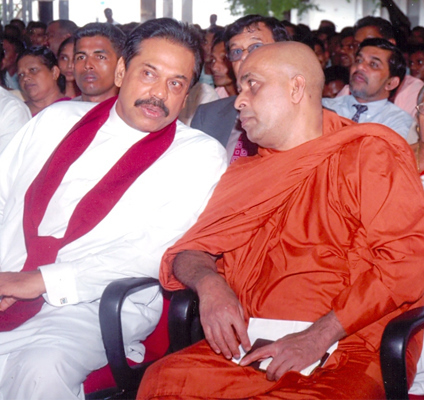 As an extremist he was very much in tune with Gamini Dissanayake’s politics of that period. Gunawanse was known to organise karate classes for his Buddhist Front and ministers had participated in black-belt awarding ceremonies. It is clear that in this (as in any other) opportunistic alliance between politician and monk, it was the politician who reaped the long-term advantages. Gunawanse came in a long line of monks who occupied such positions (e.g. Buddha Rakkitha Thero of the S.W.R.D Bandaranaike era who later featured in the latter’s murder trial). Sinha Ratnatunga’s ( now the Editor in Chief – Sunday Times) book Politics of Terrorism: The Sri Lankan Experience released in 1988, ascribes to Gunawanse an important role in the events of July 1983. He first appears (p.12) trying to whip up the emotions of the crowd at Borella cemetery. Gunawanse, wanted to harness the anger of the crowd and turn it against the Tamils. Gunawanse played on the alleged mutilated condition of the bodies to incite the crowd, demanding that the bodies be shown – ‘even a little dismembered finger’. That was the beginning of the holocaust. Malwatte and Asgiriya Chapter . This is the time to put your 2cents worth and speak without Soloving Dana and Enjoing Luxary, Get these Criminal Monks out without damaging any more. Get the Pistol and the Robe out of this unreligous monk . Other wise some day in feture you all will have no respect and no Dana. What is the meaning of Sanga Adikaranaya? Mr. Minister of Budda sasana also responsible. This is the WORST corrupt underworld criminal president of SRI lanka in our living memory. I just was recommended THE Colombo Telegraph by one of my friends. Here when I read some comments I really felt so happy to such excellent debate in this forums where there is a matter related to religious thing is discussed. Comments are more polite, Unlike in other site where in such a forum one put a picture inciting religious hatred and comments are difficult even to digest, using filthy word etc, but still it is on a religious matter. Dear All, I can not understand all this violent talk one blaming the other over and over again. Clearly faults have been made in the past by both sides. But is there any point in all this ‘you did this! talk?Does values as ‘brotherhood, love & understanding & non-violence’ still mean anything to you all? Isn’t Ahimsa a fundamental precept in all spiritual practices? In stead of always putting your focus on what parts yourself from the other, maybe start focusing on what you have in common. If you are truely a kind & spiritual person you would surely see that you all have more in common than you realise.